Sift the icing sugar into a mixing bowl and add the coconut. Pour the condense milk in, slowing mixing the mixture. It might help to thin the condense milk with about 50ml of milk… Using dough mixer beaters on an electric beater makes it much easier – otherwise, get those nails dirty and dig in! Line a baking tray (the bigger the tray, the thinner your pieces. 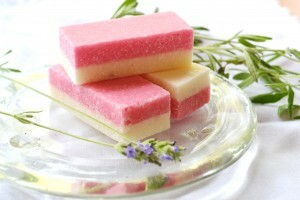 For chunky blocks, we recommend a 30 x 20cm tray) with wax paper. Pour half of the mixture onto the tray. Cover with another layer of wax paper (it really helps!) and use a rolling pin to spread the mixture evenly across the tray. Add a few drops of food colouring to the mixture still in the bowl. Mix thoroughly. Place mixture in tray and repeat the spreading process. By lining the tray with wax paper, it makes removing the coconut ice an absolute pleasure! Simply lift out and place on a cooling rack to dry out. Cut into squares and package. 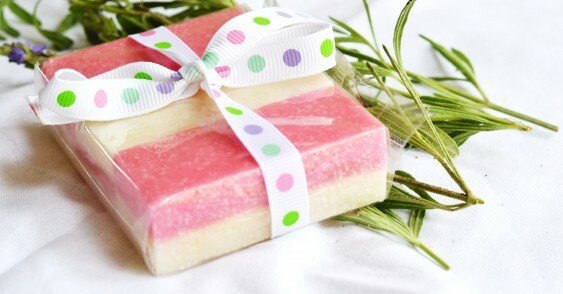 Don’t you love these ideas for packaging the gifts? So pretty, and so easy! Don’t forget to pop into the Special Events shop on Ryneveld street, Stellenbosch (or use our online shop) to get these delightful ribbons and browse our range of packaging stock.